On Wednesday, the 17th of October trading on the euro closed down. The euro sank to 1.1496 amid a general strengthening of the dollar and uncertainty surrounding Brexit negotiations and the Italian budget. Germany is making contingency plans for a no deal on Brexit. This was reported by German Chancellor Angela Merkel. The German publication Spiegel, citing European Commissioner for Budget and Human Resources Gunther Oettinger, reported that the European Commission decided to reject Italy’s draft budget for 2019. In addition to the problems in Europe, the dollar was supported by the minutes of the Fed meeting. The minutes showed that the regulator will continue to raise interest rates. 11:30 UK: retail sales (MoM) (Sep). 15:30 US: initial jobless claims (Oct 12), Philadelphia Fed Manufacturing Survey (Oct). 16:00 US: Fed’s Bullard speech. 17:30 US: EIA natural gas storage change (Oct 12). 19:15 US: Fed’s Quarles speech. The euro slowed the decline at around the 112th degree. The technical upward correction is overdue, but I think it will start at 1.1460-1.1487. Given that the European Commission rejected Italy’s draft budget, it would be better to buy against the downward movement when we get closer to the 135th degree. Oettinger said that the Italian budget for 2019 does not comply with the requirements and regulations set by the EU. Rome now needs to amend the budget and submit it to the Commission. 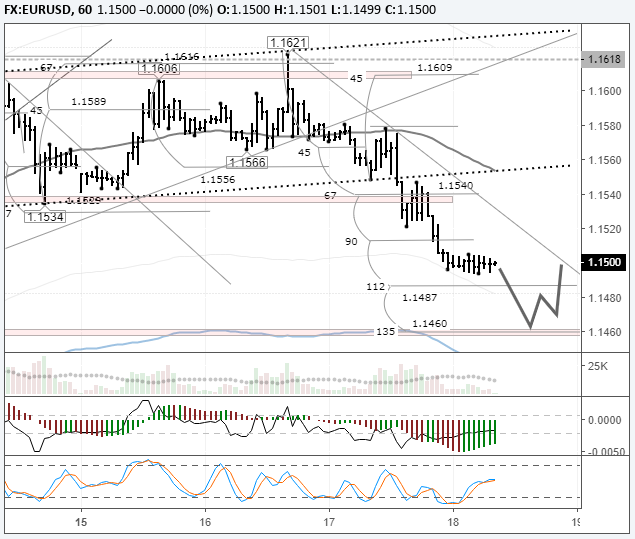 Ideally, I see a rebound from 1.1460 with the target of 1.15 (on Thursday) and 1.1525 (on Friday).